Dylan Napa is on report. 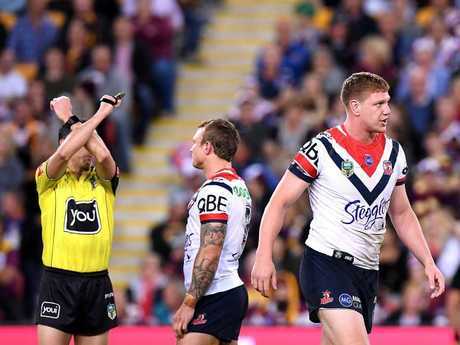 ROOSTERS coach Trent Robinson, NRL guru Phil Gould and a host of commentators have been left "seething" by the decision to send Roosters enforcer Dylan Napa to the sin bin in their Friday night loss to the Broncos. 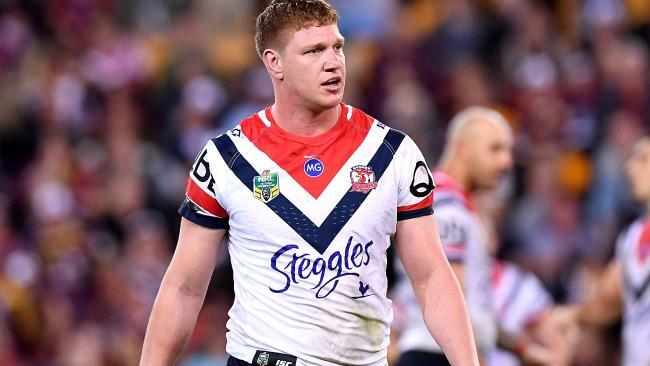 Robinson launched a comprehensive defence of forward Dylan after his controversial sin-binning for a head clash with Broncos star Korbin Sims that could have State of Origin implications. The incumbent Queensland prop was marched by referee Gerard Sutton in the 75th minute for dangerously leading with his head in a clash that felled Sims. The Broncos scored the match-winner through exciting winger Jamayne Isaako minutes later to cap a frenetic 28-22 Suncorp Stadium victory. Robinson didn't blame the call for the loss but strongly disagreed with the decision in a well-articulated defence of Napa's integrity and technique. "He (Sims) stepped off the right, rolled into the head of Dylan, Dylan wasn't even looking sideways and they've called that he intentionally went to knock him out with his head ... it's just wrong," Robinson said. "It's no one's fault there, you're allowed to be physical in our game and if someone wants to step off their right foot to avoid the contact with the left shoulder he's got to go across the head to the other side of the body - and he didn't get there ... that's how they clashed heads. "There's other issues there why we didn't win the game, but that's a gross error and unacceptable at this level." NRL commentators agreed with Robinson, labelling the decision "ridiculous" and "unbelievable". "I find it ridiculous," Gould said in Channel 9's Friday night commentary. "I just don't think that was the right decision from that collision. He should not have been penalised or sent off or anything. I couldn't agree with it." Queensland Origin great Paul Vautin said Napa was brought unstuck by Sims' late step to his left shoulder. "Napa followed him and that's how you're supposed to tackle. Hello," he said. Other commentators, including NRL legend Gorden Tallis, were even more scathing of the decision. I cannot believe that Napa call. Horrible! In every tackle since 1908 the head is in front of the shoulders. The heads collided. It happens! It’s not leading with. It’s not intentional. And it cost The Roosters the game. I was wrong. Can always count on a ref to make a stupid decision and give one side the upper hand in a close game. That Napa call defies belief. Wasn't even a penalty let alone a sin-binning. Tallis and Ben Hannant were among the many critics of the sin-binning, both labelling it ridiculous during Triple M's coverage of the game. Tallis was particularly scathing, saying every player was taught to tackle that way and the contact was simply accidental. He said the call was so bad it has to be a NSW State of Origin conspiracy designed to get Napa suspended for Origin I at the MCG. "Oh my god, that is ridiculous," Tallis said. "What! That is ridiculous. I've had enough. You have to lead with the head. When you tackle you have to have a head lean. You teach every kid that. "They'll suspend him for Origin. There is a conspiracy right now. "This referee needs to be sacked. I'm serious. I promised myself never to talk about them because we need them in the game, but I don't even want to know his name (Sutton)." Napa has carried over 75 points after an early guilty plea last round and will wait anxiously on the verdict ahead of the June 6 Origin opener. The club may even risk contesting the charge, given Robinson believed it wasn't even a penalty. "Yeah, it was the wrong call, pretty simply," the coach said. "It happens in our game, is unfortunate for Korbin but it's not a penalty or a sin bin ... it's a horrible call." 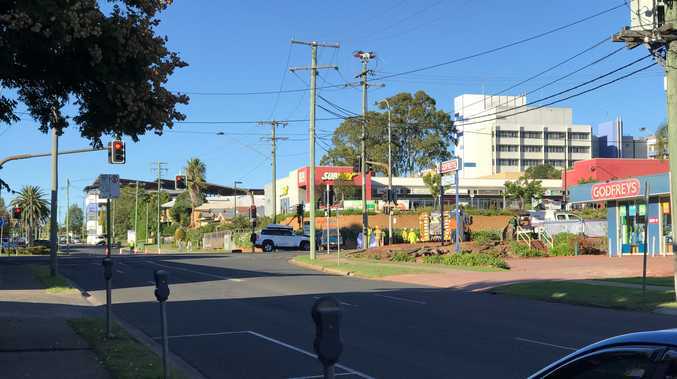 Brisbane coach Wayne Bennett wouldn't comment on the incident other than to say the tackle was "not a great look", but did say that Sims seemed to escape unscathed.